This was a ‘Sunday best’ dress worn by Elizabeth White, née Bremner. She was born at Fife, Scotland in 1850 and came to Otago as a child on the Palmyra in 1858. She married John White, a building contractor and a fellow Scot, in Dunedin on 16 April 1875. John became a well-known builder in the city and the couple lived for many years in Great King Street. John died in 1929 and Elizabeth in 1937, aged 87. They were survived by five daughters, one of whom, Elizabeth Bennet, donated the dress to the Museum shortly before her own death in 1980. 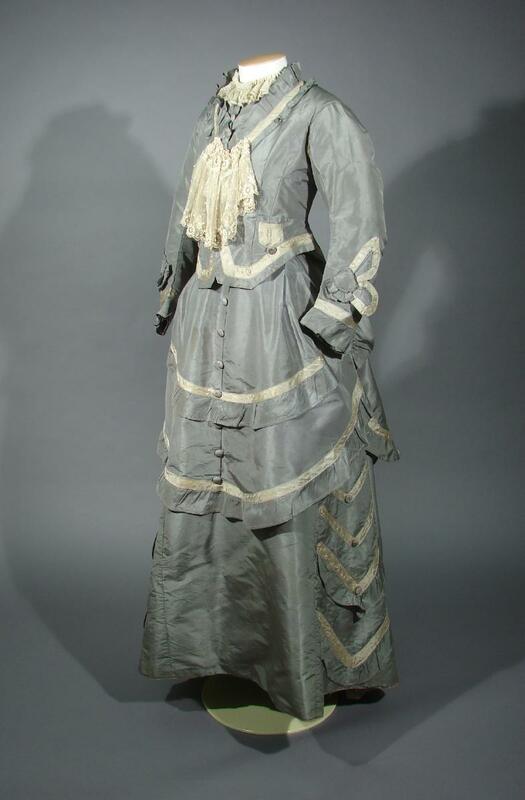 The dress is characteristic of the 1870s with its elaborate decoration – especially the use of bows, basque jacket bodice and skirt trailing to the rear. The fabric is a squirrel gray silk taffeta trimmed extensively with a light fawn satin strip. The dress is in three parts. The bodice has an unusual pleated neckline and fabric covered buttons that are repeated around the costume as a decorative device. The sleeves are close fitting and full length and have a decorative overcuff at the wrist as well as the satin trim and a bow. The basque fits down over the hips at front and back and is set off by another large bow at the back. The bodice has the characteristic 1870s watch pocket above the hip but in this case there is one on each side. The lace insert as a central panel is a later addition and may have been to allow a second and larger person to wear the dress. The skirt is very full, trailing to the rear and has a decorative panel on each side with chevrons of the satin strip, set off with a button and in the lower two chevrons with a frill as well. There is a pocket concealed in the right front seam. The third part of the dress is an elaborate over apron, which repeats the decorative elements with the satin strip, buttons and bows.